As you are planning your Hawaii vacation on Oahu, you will likely be hearing a lot about Waikiki. Waikiki is the tourist hotspot on the island of Oahu. You can take this as a good thing or a bad thing! It’s one of the most popular spots on the island, which means it can get crowded. With one week in Waikiki, these are things to consider putting on your Oahu itinerary. Maybe you won’t get a chance to do all of these things with just 7 days in Waikiki. But it can give you ideas on how to spend your short time on Oahu! 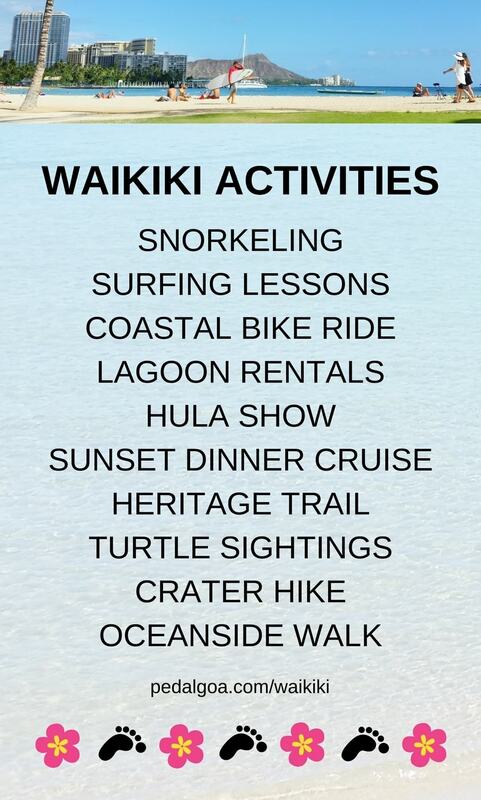 Pin this Waikiki activities list for later! Some of these activities can be done if you’re trying to do Waikiki on a budget, and some you may want to splurge on! See below for pictures, more info, and tips on Waikiki! Here are some of the best things to do in Waikiki as an active traveler! Waikiki Beach stretches about 2 miles long. 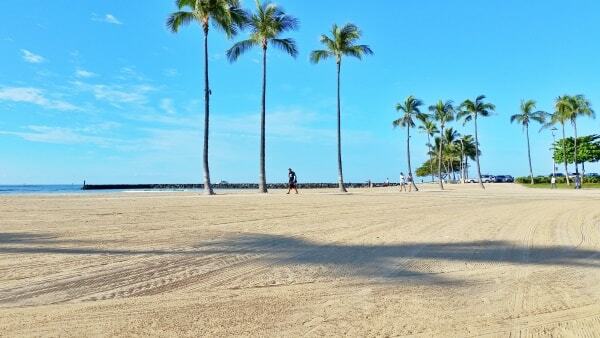 On the far west end closest to downtown Honolulu, you can start at the Hilton Hawaiian Village Beach Resort. 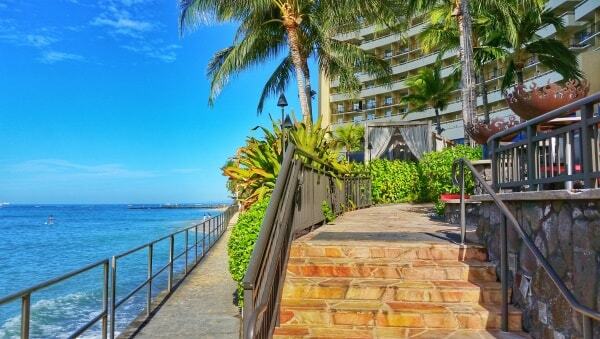 This is one of the best family-friendly hotels in Waikiki, even if you’re not a guest there. The water equipment rentals at the lagoon can make this fun! This hotel is also the one that’s famous for being a part of the Hawaii Five-0 TV show. 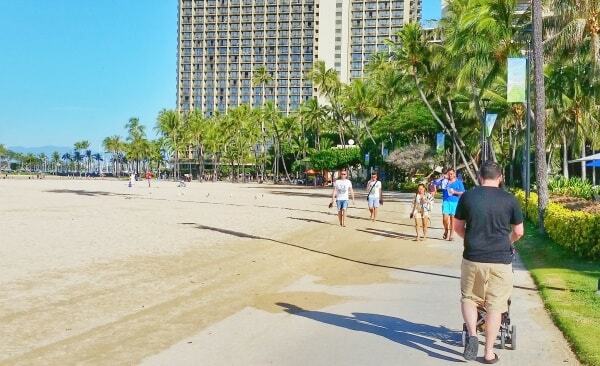 From the Hilton Hawaiian Village, you can walk all the way to the far east end to finish your Waikiki Beach walk at Sans Souci Beach Park, right in front of the best spot for snorkeling in Waikiki. You will either be walking on the beach, sidewalk, or boardwalk. You can usually walk uninterrupted with a view of the ocean the entire way. The main reason that you may not be able to walk directly along the coast is if the Sheraton boardwalk is closed because of rough waves. And after you’ve walked the 2 miles of Waikiki Beach from one end to the other, if you don’t feel like walking back, you have options! Catch the Oahu bus that goes around Waikiki back. There’s a bike rental in Waikiki in which you can rent the bike in one spot and return it in another spot! You can choose any part of Waikiki to run, but the best places are where the sidewalks are pretty much directly along the coast! There are 2 main sections that can be the best for running in Waikiki in terms of getting the best views of the ocean during your evening run or walk. These sections would be at the far ends of either side of Waikiki Beach. So again, that would be near Hilton Hawaiian Village on one end, and near San Souci Beach Park on the other. There are walking paths in these areas that go pretty much right along the ocean. So be sure to include these parts in your run! These also make for great places to walk, and great places to push a stroller if you’re traveling with young kids on Oahu too. Hawaii doesn’t sound like a bad place to have your first surfing experience! But you don’t have to drive an hour to the North Shore from Waikiki to get a taste of surfing. There are surf lessons offered all along Waikiki Beach. You can expect the price of surf lessons to be around $100-150 for private lessons. If you have more people in your group, it will cost less. 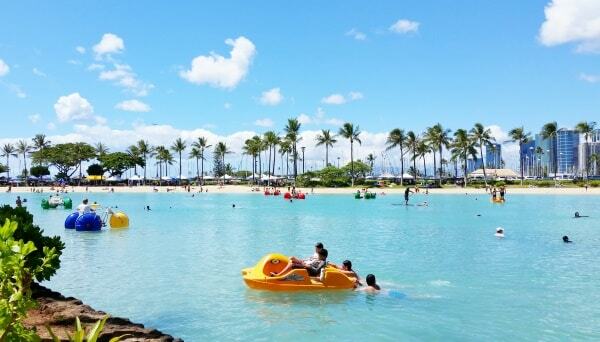 Hawaii is the perfect place to have water adventures! And how about above the water?! There are these amazing helicopter tours! Hawaii is home to a culture that’s far different than any other culture that you will find elsewhere in the United States. So another activity to consider is to take in some Hawaiian culture! The best way to do this during your short time on Oahu would be to attend a Hawaiian luau. A luau will provide you with a Hawaiian feast and entertainment. Another way you can experience a bit of Hawaiian entertainment is by attending a Hawaiian dance and music show right in the heart of Waikiki! There are free hula shows in Waikiki several times a week. These are held in the evening and start around sunset. The shows include hula dancing, live Hawaiian music, torch lighting, and the blowing of a conch shell. It’s an outdoor setting right along the beach. 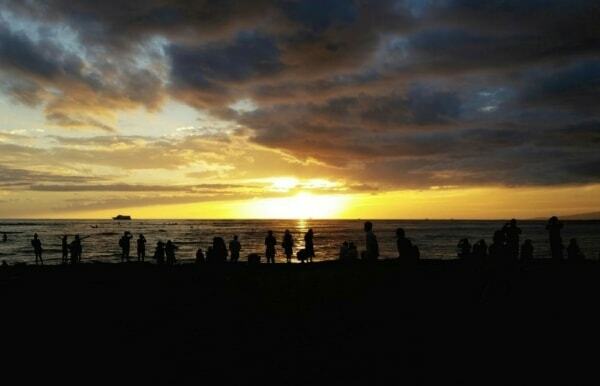 While you’re waiting for the show to begin, you can see the beautiful Waikiki Beach sunset! Another option that makes for a memorable Hawaiian sunset is to go for a sunset dinner cruise! Oahu has 3 marine conservation districts that are protected areas for marine life. These are also the top spots to snorkel on Oahu! 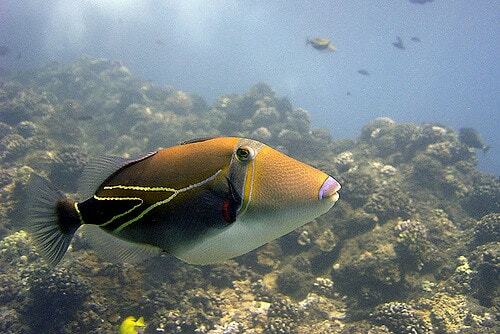 You can find one of these marine conservation districts in Waikiki at Queen’s Beach, which makes it one of the best spots for snorkeling in Waikiki. This is located on the far east end of Waikiki Beach. 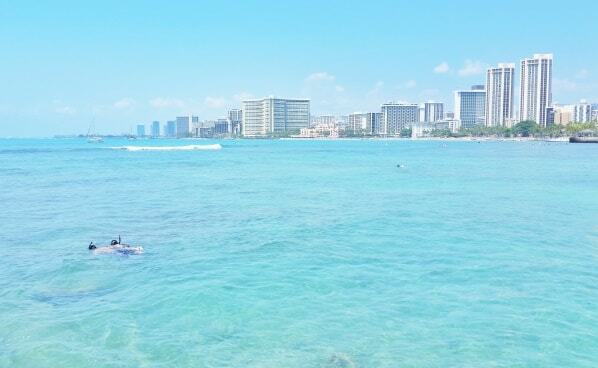 Going swimming or snorkeling here also gives you amazing views of the Waikiki skyline! At this snorkeling spot, you’ll likely find tons of colorful fish swimming around. But if you do want to impress some people (and yourself! ), you can break up the name to remember it better. It’s basically a bunch of repeated words: humu-humu-nuku-nuku-a-pu-a-a. No guarantees, but you might be able to spot a turtle here! 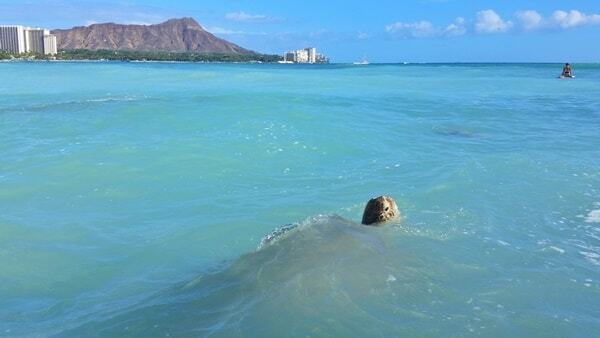 There have been turtle sightings in other parts of Waikiki too. But Waikiki turtle sightings in general have a little to do with luck! The most popular hike near Waikiki is the hike that will get you the best views of Waikiki Beach and downtown Honolulu from above! That’s the Diamond Head Summit Trail. This is one of the crater hikes in Oahu. The Diamond Head crater was formed by a volcano. It’s possible to complete the trail within an hour. But it’s best to give yourself more like 1.5-2 hours so you can take your time and enjoy the views! This isn’t a completely free activity. It’s $1 per person if you arrive by foot, and it’s $5 per car if you drive to Diamond Head. 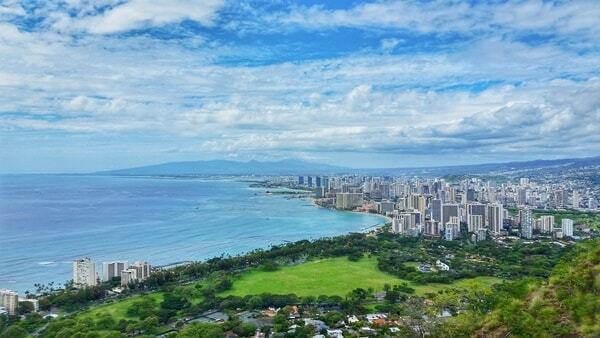 It’s easy to catch a bus from Waikiki to Diamond Head. This is about a 10-15 minute bus ride, and it will drop you at the base of the Diamond Head Crater. From there, it’s a 10-15 minute walk to the start of the trail. You’ll pass by an overlook on your way to the trail, and you might want to stop there for a few minutes too. But you don’t need to spend too long here, as the best views are yet to come during your hike! You can walk from Waikiki to Diamond Head too, and many people do. There are sidewalks the entire way, and it’s completely safe. It will add about 40 minutes to your hike each way, although this will also depend on where in Waikiki you’re staying. 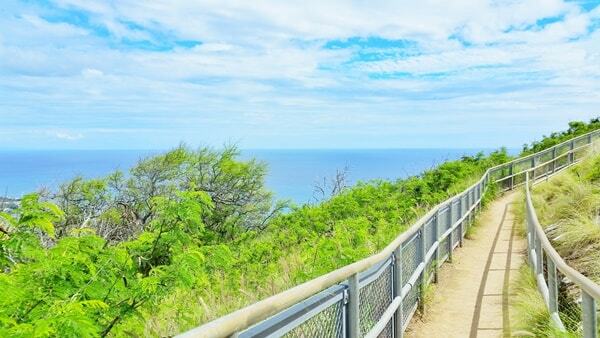 Can you wear flip flops on the Diamond Head Hike? Well, you can, and you will likely see many people wearing flip flops on the trail. But that doesn’t mean it’s the best option! Many hikes in Hawaii are lined with loose gravel on the trails. This can create for conditions that might make you slip a little, especially when it’s on an incline. You’ll find parts of the trail on Diamond Head to be like this too. That’s why it could be a good idea to think about the best shoes for hiking in Hawaii. This can include travel sandals for hot weather that give you a little bit of extra traction. 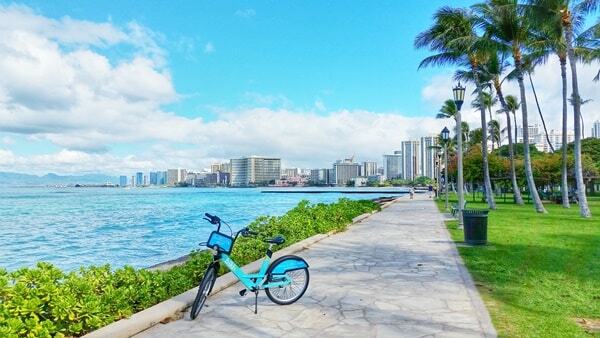 In Waikiki, you can go for a bike ride right along the coast too! There are bike rental stations all over Waikiki, which makes it super convenient to go for a bike ride! These are bike sharing stations that are located around Waikiki and Honolulu. It’s set up so that you can rent a bike at one station, ride down the street, and then return the bike at another station. Again this isn’t completely free, but it’s less than $5 per person if you keep your Waikiki bike ride under 30 minutes. If you’re staying at an airbnb in a residential neighborhood, chances are that there is a grocery store nearby. So head on over to a grocery store (Foodland, Times, and Safeway are stores to look for), pick up some picnic food, and enjoy a cheaper meal at one of the many picnic tables that can be found on the coast of Waikiki! There are a couple of parks that are along Waikiki Beach, like Fort DeRussy Beach Park and Sans Souci Beach Park. 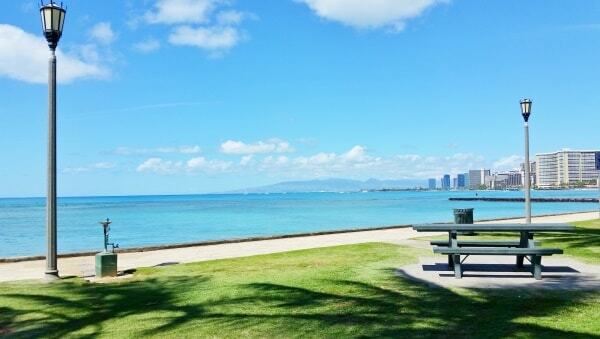 You can also find a number of other picnic tables in certain parts of Waikiki that give you oceanfront views too. And then of course, another option is to have your picnic right on the beach! 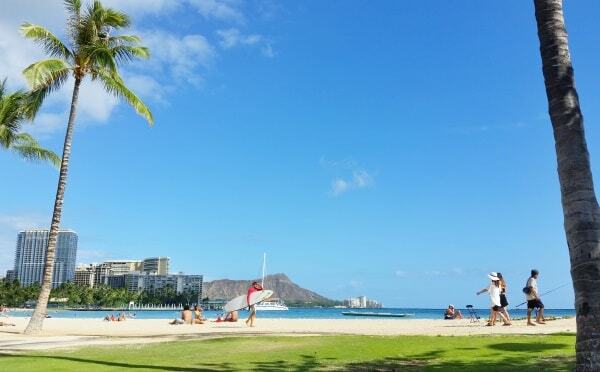 So, should you stay in Waikiki during your Hawaii vacation?! Well… that depends! 😉 This largely depends on what you want out of your Hawaii vacation! Waikiki is the main area of Oahu that the vast majority of visitors stay. You’ll find world-class hotels in Waikiki, and of course, with that recognition comes high prices! 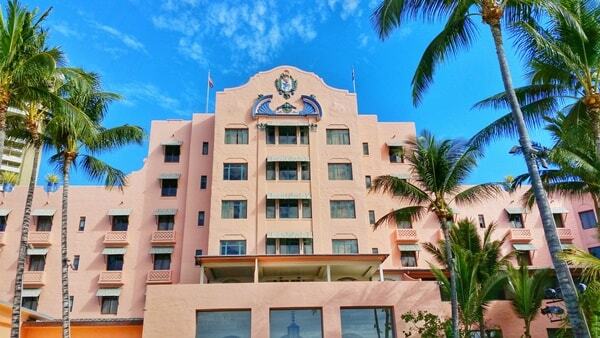 This is the Royal Hawaiian Luxury Hotel, aka the pink hotel in Hawaii. For a quick glance of hotel prices just to get an idea of what to expect, see this list of the best Waikiki hotels. 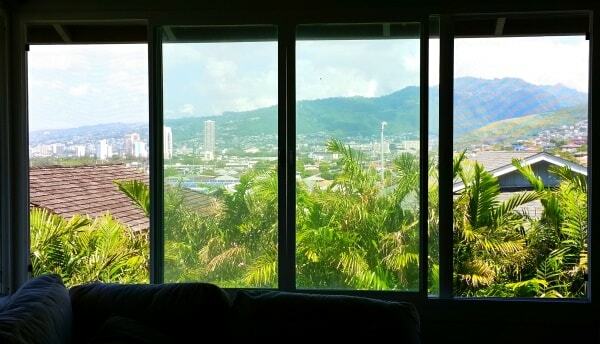 As an alternative, airbnb and vacation rentals on Oahu can often save you money on accommodation. Should you stay in a hostel in Waikiki? Staying in Waikiki is a good base for exploring the island. This is especially because there’s reliable public transportation and you can get around Oahu by bus. From Waikiki, it’s not too bad to go by bus to places like Diamond Head, Koko Head for a strenuous hike, popular Hanauma Bay for snorkeling, and Pearl Harbor. Consider taking the bus for some of your time on the island, and then renting a car for a day or two. 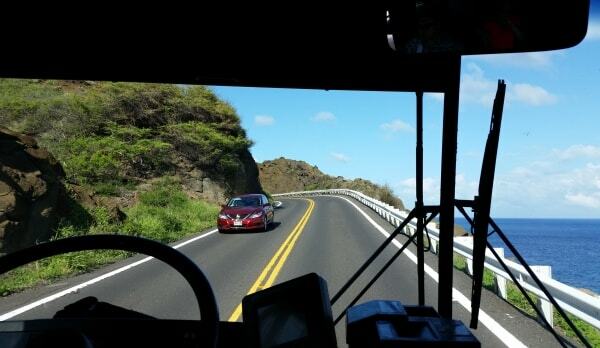 The bus does travel around the island, but a car can save a lot of time to go to some of the other best places on Oahu like the North Shore or windward Oahu.